You know it’s spring in Brisbane when the magpies start to swoop. This year for the first time, we have one in our street and it has been attacking us for a couple of weeks now. It only seems to attack if we’re on a bike or scooter. So during this time when the bird is protecting its nest, we make sure we’re wearing a helmet and sunglasses. I feel a bit sorry for the magpie having to be on high alert all of the time. I’m not sure why, if we’re walking, it doesn’t feel threatened. 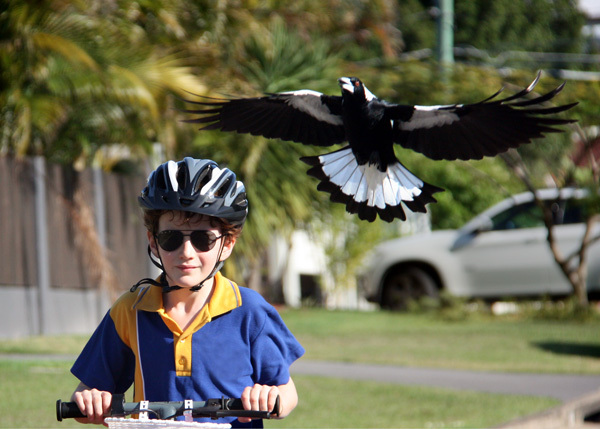 Not all magpies will swoop when they’re nesting and the Brisbane City Council website suggests that swooping magpies might have had a previous bad experience with humans. I’m hoping that it will eventually realise we’re not going to hurt its young, and will ignore our scooters and bikes. A Griffith University article suggests that some magpies recognise individual people and will single them out for attack while leaving other humans alone. The article does have a potential solution which involves bribing the bird. I’m tempted to see if our magpie can be won over. I love having magpies in our garden. Apart from the fact they eat mosquitoes, they have a beautiful call and sometimes when I’m digging in the veggie patch, one will sit on a nearby branch singing its beautiful song. You can hear a recording from the Birds in Backyards site. If you’ve had any magpie experiences you’d like to share, please leave a comment. This entry was posted in Outdoors, Wildlife. Bookmark the permalink. 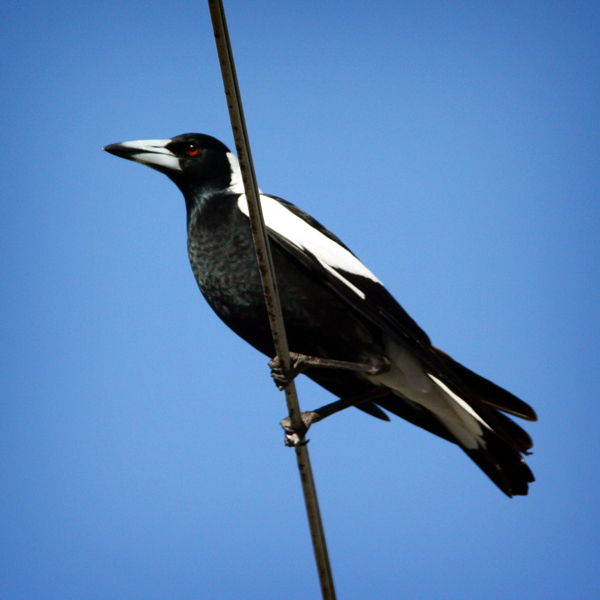 To help avoid persistent aggressive magpies go to http://www.magpiealert.com where there’s a google map for people across Australia to register their attacks. They’ve even got some good tips too.